Dave and his Cool Bus-with Fuji the artosauraus up there. Let it be known that I have never driven any kind of bus, “school” or otherwise. But I am no stranger to school buses. While growing up in Michigan, I spent a substantial portion of my life riding around in them, specifically, from about the third grade all the way through my high school years. Sometimes my younger brother and I were the very first ones to board in the morning. 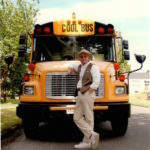 This was the case in those years when the established bus routes happened to allow us to be the first stop from Shorty’s farmhouse there on the corner of Little Glendora Road and Red Bud Trail (Shorty was our driver on such occasions). Getting to the bus stop, which was a quarter mile or so down the south hill of Aalf’s Road, was cause for little concern in the spring and fall. However, that early morning hike could be brutal in the winter. Donned in heavy coats, mittens, knit caps, ear muffs, wool scarves and black rubber boots with metal clasps up the front, it was not uncommon for Johnny and me to emerge from the backdoor of our hilltop house only to find ourselves stepping into the inky blackness of a full-blown, predawn blizzard. On such mornings, my first order of business was to wrestle against the gale to secure the ice-encrusted door behind me without dropping my books in the snow (no backpacks in those days). The two of us would then set off down to the main road where Shorty would be patiently waiting in his big pre-warmed, yellow and black jelly bean. Slogging through knee-deep snow drifts and squinting through ice-encrusted eyelashes, we would become fixated on the white fluff flashing horizontally through the low beams of Shorty’s bus, beckoning us with the promise of shelter. My favorite spot was in the first seat right behind Shorty and next to the window where I could rest my numbed, booted feet on the edge of the blasting heater and listen to the music (Shorty had installed a radio in his bus so we could all enjoy the tunes from WLS/Chicago as we rode through the countryside). I remember how most of the dash lights were reds and greens, glowing brightly in the otherwise dark confines at those wee hours. It was decidedly “Christmassy.” Sometimes, when the season was upon us, I would fall asleep there while visions of gold stars on report cards danced in my head. Once, when I was about eight or nine years of age, Shorty confiscated a stick of dynamite I had found and brought on board to show off to my buddies. It was a slender, white plastic tube, about six inches long, with a white fabric string of about the same length sticking out one end (the fuse, I presumed. There was also something fluffy on the other end of the string, which remained inside the tube). I was kinda ticked. Nevertheless, he later cheerfully returned it to my red-faced mother who thanked him and then, after giving me a proper scolding, put it back in the carton in the bathroom cabinet where I had found it. Looked like dynamite to me. I had seen plenty on TV watching Roy Rogers and Gene Autry—they, too, were always getting into trouble with sticks of dynamite. 8. Hey, I’m not kidding….all carnivorous ducks will be kept in their AAAAAHHHHHHHHELP!! What! You didn’t walk up hill to school and up hill from school in the snow. Funny story Skip. I always enjoyed hearing your childhood tales. This one is especially funny. I rode this route, too, in the 70’s. Mrs. Starkweather was our driver.